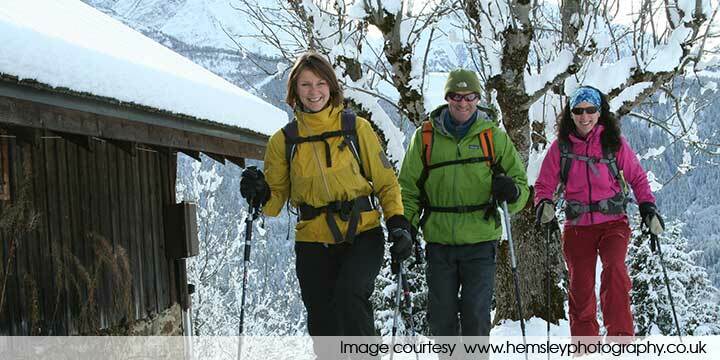 Enjoy a snowshoeing holiday based in the Chamonix Valley. The Mont Blanc massif offers wonderful snowshoeing: trek through forests, magically tranformed by winter, visit snowy summits with vast panaramic views and explore the wilder corners of the region. Your snowshoe holiday will be lead by a knowledgeable, friendly and fully qualified mountain leader whose aim is to add depth to your adventure. All our scheduled trips are guaranteed to run. This snowshoe shortbreak will take you to some of the best viewpoints in the Mont Blanc area: above Chamonix and through into Switzerland. Day 1. 6pm Meet your guide at your hotel for your holiday briefing and to answer your questions. Day 2. Chalets Chailloux. A day to warm up for our adventures. Today we become accustomed to our snowshoes as we walk up to the Chalets Chailloux. Climbing through snow-laden trees we emerge at the chalets where the view unfolds with the best panorama of the Chamonix valley and Mont Blanc. We will also spend time today familiarising ourselves with the avalanche transceiver safety equipment. Height gain approximately 570m. Day 3. Mont Arpille. Our day takes us into Switzerland for this classic snowshoe peak. Having ascended through forest we find ourselves in a beautiful alpage before heading on up to the summit with its 360° views of the Rhone valley and the Grand Combin. Height gain approximately 756m. Day 4. Alpage de Loriaz. Today we visit the dramatic beauty of the Berarde valley before journeying up through snowy woodland to the high alpage of Loriaz. This fabulous vantage point gives us views of the Le Tour and Argentiere glaciers and their surrounding peaks. Height gain approximately 690m. Contact us to ask about this holiday or download the booking form. Three days snowshoe guiding by a locally-based, friendly and fully qualified (UIMLA) mountain leader. Group size: no minumum, all our trips are guaranteed to run. Maximum group size of 8. Accommodation: four nights, half board in a 2** hotel or above. Prices based on two people sharing a twin room. If requested single rooms may be available, a single person supplement may be applied. All snowshoe and safety equipment: snowshoes, poles, avalanche transceiver, shovel and probe which must be carried by each client on a MountainBalance trip. Transport between your hotel and the snowshoeing destination of the day. On this week long snowshoe holiday you will visit beautiful summits and viewpoints around the Mont Blanc massif in France, Italy and Switzerland. Day 1. Meet your guide at your hotel for your holiday briefing and to answer your questions. Day 2. 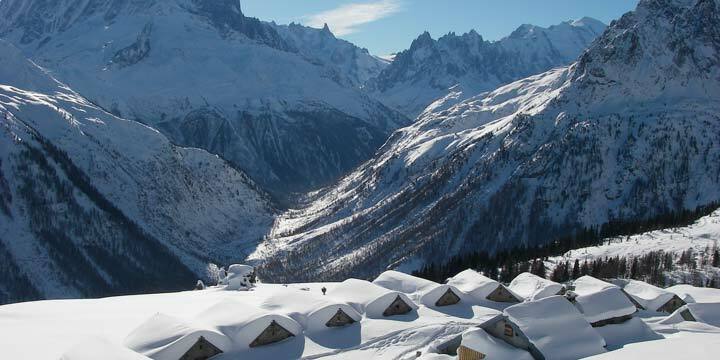 Chalets des Mayeres. These chalets stand in the now-snowy meadows at the foot of the Aravis peaks. 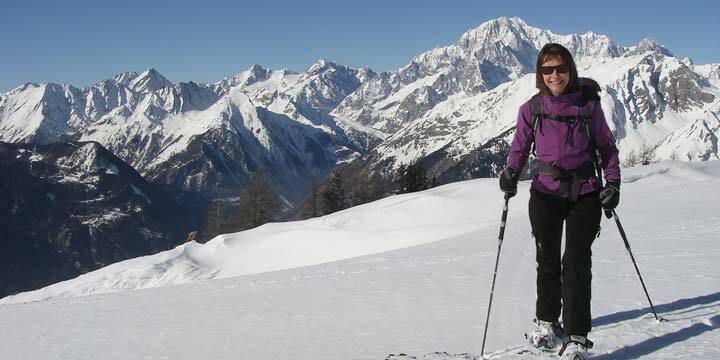 Les Mayeres offers excellent snowshoeing and magnificent views of the whole Mont Blanc range. Today we will familiarise ourselves with our snowshoes and the avalanche transceiver safety equipment. Height gain approximately 550m. Day 3. Alpage de Loriaz. Today we visit the dramatic beauty of the Berarde valley before journeying up through snowy woodland to the high alpage of Loriaz. This fabulous vantage point gives us views of the Le Tour and Argentiere glaciers and their surrounding peaks. Height gain approximately 690m. Day 4. Mont Truc. We travel to the Les Contamines valley to climb the delightful snowshoe summit of Mont Truc. The views are different here: closeby the glacier tumbles down the north face of the Dome de Miage and on out to the ridges of the Aravis and the Fiz. Height gain approximately 765m. Day 5. Mont Arpille. Our day takes us into Switzerland for this classic snowshoe peak. Having ascended through forest we find ourselves in a beautiful alpage before heading on up to the summit with its 360º views of the Rhone valley and the Grand Combin. Height gain approximately 756m. Day 6. Court de Bard. For a change of scenery we travel into Italy to the Val d'Aoste. Our departure point is a small hamlet above the main Aosta valley from where we snowshoe up through trees to emerge on a broad ridge. From the 'Table d'Orientation or Tavola di Orientamento' there are stunning 360° views including the south side of the Mont Blanc and the Vertosan valley. If energy allows we may continue along this beautiful ridge to enjoy more of the views before we descend and travel back to Chamonix. Height gain approximately 614m. Day 7. Tete de Sallaz. The Tete de Sallaz stands at the northern end of the Aravis from where we will have incomparable views of the Mont Blanc range and the deep snow-filled cwms of the Aravis themselves. 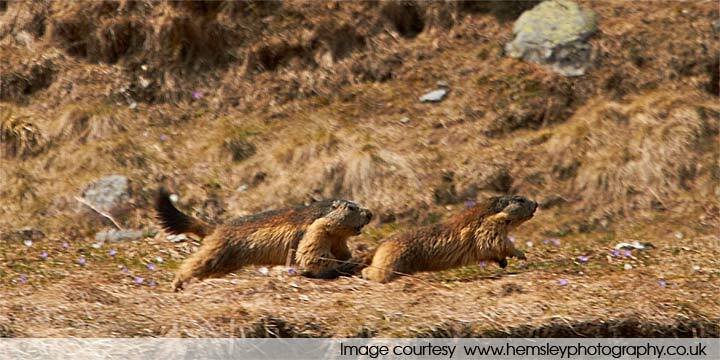 Close to the summit there is a protected area frequented by capercaillie and other alpine animals. Height gain approximately 700m. 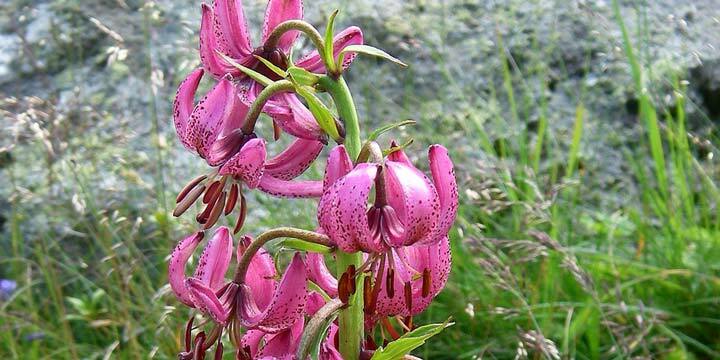 Six days guiding by a locally-based, friendly and fully qualified (UIMLA) mountain leader. Group size: no minimum, all our trips are guaranteed to run. Maximum group size of 8. Accommodation: seven nights, half board in a 2** hotel or above. Prices are based on two people sharing a twin room. Single rooms may be available on request, a single supplement may apply. 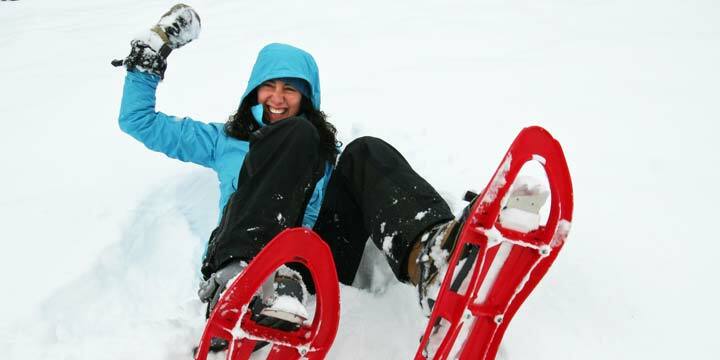 All snowshoe and safety equipment: snowshoes, poles, avalanche transceiver, shovel and probe which must be carried by each client on a MountainBalance snowhoe trip. All transport between your hotel and the snowshoe destination of the day. Options: we can arrange your transfer between the airport and your hotel with our trusted transfer partner. We can also arrange extra nights accommodation. 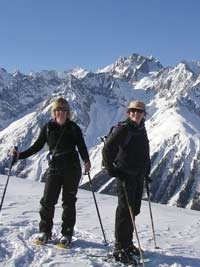 MountainBalance has joined forces with Chamonix-based Descent Travel in order to offer our scheduled snowshoe holidays. All bookings for our four night, seven night and bespoke packages are made with Descent Travel and delivered by MountainBalance. By working in partnership with Descent Travel our clients have the financial secuirty of booking with a Travel Trust Association member (number Q2913). It also means that when our MoutainBalance team is out in the mountains leading groups our clients have a team of people to help with every element of their holiday. Our terms and conditions appear here. 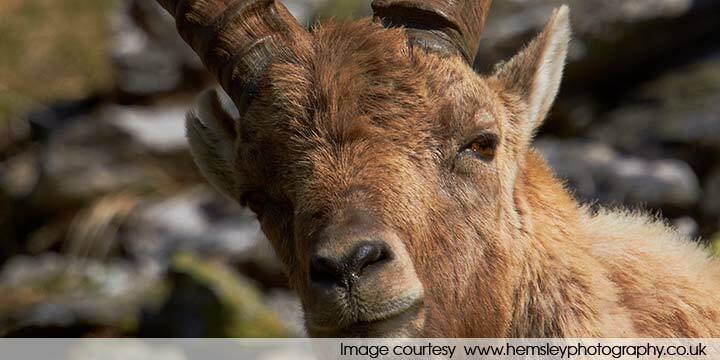 As MountainBalance is registered in France we show the package holiday prices in Euros. As these are then booked through our UK booking partner Descent Travel your holiday will be payable in pounds. The price conversion from Euros to GBP will be calculated at the current exchange rate at the time of booking. See our FAQs answered here.